For the first time in New York State’s legislative history, a Chinese American was elected to the State Assembly yesterday. Jimmy Meng, a Democratic from Flushing, Queens, won 71 percent of the votes, easily defeating Republican Mailin Tan, who won 20 percent, according to unofficial early results. “The impact of my victory is a big, big encouragement for all the Asian Americans in the country,” Meng said at victory party late last night. In a sign of Asian Americans’ growing political influence, the Republican, Democratic and Green Party candidates in Assembly District 22 were all Chinese American. On the campaign trail, Meng always kept the Korean and Spanish interpreters alongside him while going door-to-door to say hello to potential voters. He said it was the most effective way in turning out voters “because people could see you were working hard.” In his campaign office, people who spoke Chinese, English, Korean and Spanish worked side by side in registering voters and answering phone calls. The 22nd Assembly District, which lies east of the Van Wyck Expressway, from the Long Island Expressway to several blocks north of Northern Boulevard, was redrawn after the 2000 census so that it embraced the Asian-American community more completely, thus uniting the Asian vote. In the state Democratic primary in September, Meng ran what Liff described as an “insurgent campaign” against the incumbent, Assemblyman Barry Grodenchik, who had the support of the Queens Democratic organization. In that race, Meng won 2,877 votes, or 51 percent, to Grodenchik’s 2,311 votes, or 41 percent. A third candidate, Benjamin Singer, received 425 votes, or 8 percent. A week later, Grodenchik’s campaign staff accused Meng of bringing out “ghost voters” to support him during the election. They submitted to the city Board of Elections for further scrutiny a list of 191 voters, who they said had registered with problematic or even nonexistent home addresses. It turned out that 10 people on the list had provided their home addresses as 135-29 Roosevelt Ave., which just happened to be the Chung Hwa Book Co., a commercial building owned by Meng and used as his campaign headquarters. Voters must register in the district where they live and should notify the voter registration staff if their home addresses have changed before the election, according to the city Board of Elections. “The incident has nothing to do with me,” Meng said on Election Day, adding that those 10 people were registered in 1997 and did not vote this September. He said he was not directly involved in the voter-registration work. “Given that the Queens’ addresses are very complex in its nature, some new voters were not familiar with the registration regulation,” said Teresa Young, a key aide to Meng. “It’s understandable that minor mistakes might be made. But it’s not our problem.” She said that many people on the suspect list actually voted in the City Council election in 2001, and not this time. 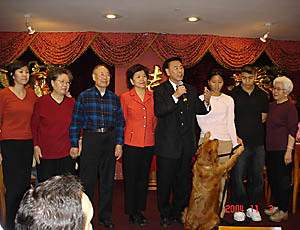 On the other hand, Councilman John Liu, who became the first Chinese-American city councilman in 2001, insisted that he never heard any story of “ghost voters” during his campaign three years ago. Although the city Board of Elections certified Meng’s victory in the Democratic primary, where he defeated Grodenchik by 566 votes, the board started a probe to investigate any possible voter fraud. The board formally notified the 191 voters that their voting record in the primary election was nullified due to the apparent illegal registration. Born in Shandong province in China, Meng lived mostly in Taiwan before he came to the United States as a graduate student of English in 1975. Meng, 60, has lived in Flushing with his wife and three children for more than 25 years. He owns the Queens Lumber Company and the Chung Hwa Book Co. in downtown Flushing. Meng was a member of former Mayor Rudolph Giuliani's Small Business Advisory Council, and is chairman of the Asian American Coalition of Queens, chairman of the Flushing Business Association, and board member of Queens Borough Community College and the Queens Public Library. As the chairman of the Flushing Business Association, Meng initiated a sanitation drive in an effort to get rid of the stinking trash often piled in front of the storefronts, especially busy restaurants in downtown Flushing. “Meng is a firefighter for this neighborhood,” said Connie Chang, who is Meng’s secretary at the nonprofit business association. Democratic Assemblymen Anthony Seminerio from Richmond Hill, Brian McLaughlin from Flushing, Mark Weprin from Bayside, City Councilman Hiram Monserrate from Corona and City Councilman John Liu from Flushing also joined Ackerman in announcing endorsements of Meng last Tuesday. Candidates debate “If I’m elected, I’m going to work on two issues as soon as possible: first, fighting on all levels for funding from the state and the city; second, reaching out to all the ethnic groups of this community and asking them what they want me to do for them,” Meng said while debating the Republican candidate, Meilin Tan, and the Greens No to War candidate, Evergreen Chou, in the Sheraton LaGuardia East Hotel in Flushing last Tuesday night. Tan criticized Meng, saying, “He doesn’t have solid connections with the established state and city officials. He’s not able to win as much funding as this community needs.” During the campaign, Tan repeatedly portrayed herself as an old friend of Gov. George Pataki and Mayor Michael Bloomberg. At 61, Tan is an experienced real estate broker in Flushing, where the Democratic voters outnumber the Republicans by a ratio of almost 5 to 1. In the debate, Chou challenged Meng’s position on hoping to see more luxury apartment buildings in the community. “Nowadays, the housing rent in this neighborhood is soaring,” Chou said. “The working-class people cannot afford to live in the expensive buildings.” Chou, 40, works as a sonogram technician in the Lutheran Hospital Center in Brooklyn. “I always represent the interests of the majority of the people here. However, some rich businessman does not,” Chou said. Meng replied that he would listen carefully to people’s opinions and try to represent the community as a whole. With many first-time voters having registered during the primary election, at least 18,930 voters in the Assembly district turned out to vote on Election Day. According to the city’s Board of Elections, 67,159 new voters had registered in Queens in the past nine months. While the board didn’t break down the statistics by ethnicities, Asians and Latinos were the fastest growing groups of voters, according to the related reports. In the state Democratic primary on Sept. 14, nearly 1,000 more voters in Flushing participated than in the 2002 primary. During the Democratic primary, however, Liu supported the Jewish incumbent, Assemblyman Grodenchik. 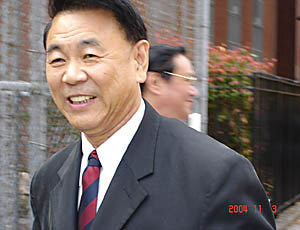 Liu later criticized Meng for winning a close and bitter victory by campaigning heavily on ethnic appeal. Meng said any suggestion that he reached out only to Asian-American voters was an unfair comment on the work that went into his victory. He said his campaign staff worked tirelessly to build a diverse coalition including all ethnic groups in the community. Meng’s daughter Grace, his campaign manager, added that in order to calculate the turnout rate of each ethnic group, the campaign workers would make a particular racial mark behind each voter’s name on the registration roll. Meng has made history by becoming the first Asian-American assemblyman in Albany. In the meantime, people in the Queens district are yearning for Meng to bring home more benefits to the community. Liu said that being the only Asian American of the 51 members in City Council was fun but hard. “I very often have to stand on issues alone. There are a lot of issues that my colleagues don’t want to get involved in, mostly because they don’t understand them, like why a law-abiding Chinese clerk was beaten to death on the street.